With every dish being a culinary masterpiece in its own right, this spirited cuisine offers an unforgettable gastronomic experience for a gourmet traveller. It is said in south India that one is lucky to eat like a Chettiar. Chettiars (also called Nagarathars) were a small community of traders, merchants and bankers who lived at Poompuhar and Kaveripatnam under the Chola kingdom. Legend has it that a great flood in the 8th century prompted a mass exodus of Chettiars from the Coromandel coast to the arid heartland of Tamil Nadu. The Chettiars resettled in the Karaikudi region from where they strove to re-establish their fortunes through trading with far off kingdoms. History tells that the Chettiars played a key role in south India’s spice trade with countries like Burma, Java, Khmer (Cambodia), Ceylon (Sri Lanka) and Mauritius. The culinary tradition of the Chettiars reflects the interesting history of the community. Having lived in proximity to the sea, the Chettiars used seafood to create many of their signature dishes such as the meen kuzhambu (fish curry), nandu (crab) masala, sura puttu (shark fin curry), and eral (prawn) masala. When the community later settled in the hot and arid Tamil hinterland, they included wild game such as jungle fowl, kada (quail), muyal (rabbit), and pitta (turkey) into their dietary habits. 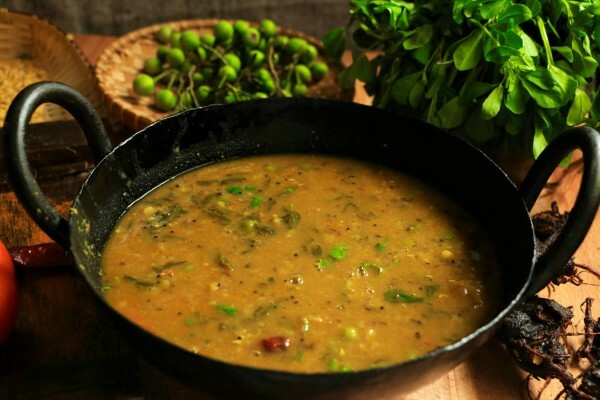 Most of these pre-dominantly non-vegetarian dishes were, and still are, eaten with rice and rice based accompaniments such as dosais, appams, idiyappams, adais and idlis. The traditional Chettinad dishes mostly used locally sourced spices like the star anise, pepper, kalpasi (stone flower) and maratti mokku (dried flower pods). Foreign ingredients and preservation techniques like sun-dried meats, berries, salted vegetables and pickles in brine also enriched the culinary repertoire of this well-travelled community. Kavuni arisi (black sticky rice pudding) clearly has a Burmese influence while the Idiyappam (steamed string hoppers) has a Sri Lankan touch. Since food was such an essential part of a Chettiar’s life, the kitchen was one of the largest and most important places in a Karaikudi house. Here, the womenfolk or aachis prepared elaborate meals for the household – hand-pounding fragrant spices in stone grinders, chopping vegetables with the aruamanai (iron blade) and burning different firewood to develop specific flavours. These meals were often accompanied by buttermilk or nannari sherbet to tone down the heat of the cuisine’s fierce curries. At the lavish Chettiar wedding feasts, the samayalkar (team of cooks) would toil under the guidance of senior aachis of the family to make six main course grain dishes, nine savoury side dishes and six types of sweets. Many of these samayalkars would later go on to set up their own eateries in the Karaikudi region. Even the utensils used in the Chettiar kitchen were beautifully made and have become collectibles today, valued for their design, size and vintage make. Traditional meals served Chettinad style on banana leaves follow a specific protocol – each dish has a designated space and order in which it has to be served. Items served first are placed at the top left corner of the leaf, progressively moving towards the right in the following order – salt, pickle, mor milagai (sun dried chillies in curd), varuval (a spicy dry dish), kootu (a lentil curry), urundai (fried lentil balls), poriyal (sautéed vegetable dish) and masiyal (a vegetable mash). Appalams (papadums), fritters and fries are placed at the bottom left while rice and chapatti, paired with sambar, rasam or kuzhambu, occupy the centre. The bottom right is reserved for sweet dishes like ukkarai or paal payasam.